Party people know a good thing when they see it. And shots lining up on a shiny bar are one of the sights that make their eyes sparkle. There can be no doubt that Glasgow is a haven for party animals, and bars with the intention of getting the evening off to a wild start are in the right place and the right time. Can you handle the pace? Then get a couple of strong ones down your neck, pick up a cocktail, and see what the evening has in store for you. 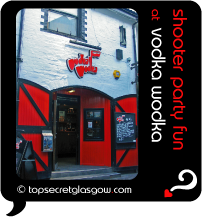 Vodka Wodka attracts party people, having fun tasting top-range vodka and hip shooters in cosy, happy bar at the heart of Ashton Lane. Great news! Finding this page means you can now join our VIP list for DRINK Cocktails & Shots. Time to grab your very own page for DRINK Cocktails & Shots. Do you have a special story about a time you decided to DRINK Cocktails & Shots? A funny experience? A grand occasion? A funky photo? A personal tip? A top secret?